The Sophisticati have set about diluting the honor in the public mind of those who have sacrificed themselves for our country. The Viet Nam Memorial tells only that the names affixed are of the dead, nothing more than a giant black tombstone. The World War II Memorial is ultimately only an homage to the states and territories of the United States during the war, artificially set apart into Atlantic and Pacific halves, and stars mark the numbers of dead. There are attempts to deliberately obscure faces of statues in order to achieve a politically correct homogeneity, even when the identities of the honored are known. Even the Martin Luther King Memorial suffers from political cleansing. 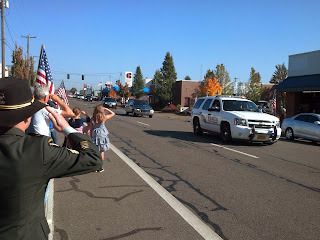 The cortege enters town. My eldest son, of the 1st Cavalry Division, renders a salute along with Cody's nieces. 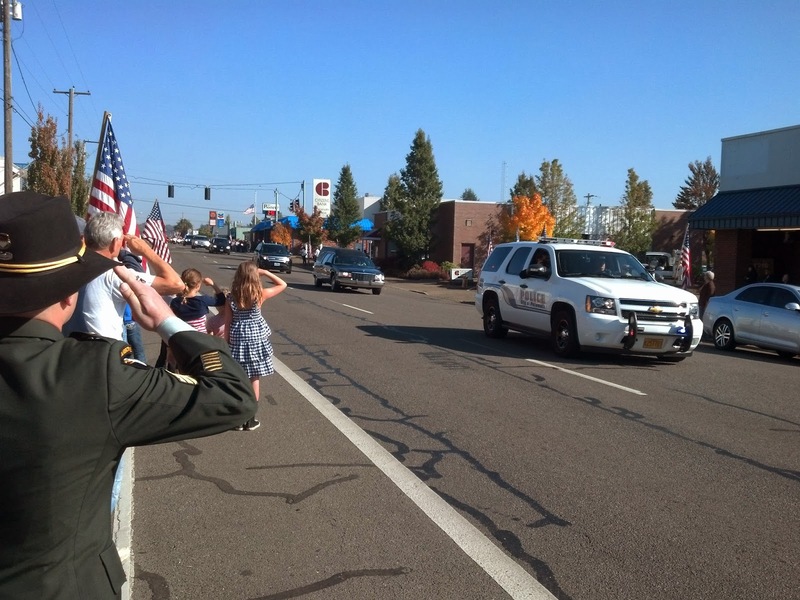 But for our small community, the people themselves overcame this enforced ennui to assemble in the thousands to pay their respects to the sacrifice of SPC Cody Patterson, who fell in action responding to a Taliban ambush. Some press accounts list him as a victim of a suicide bomber, but a more accurate description of the events show that the bomber along with a female accomplice had already detonated, causing other casualties, and a Ranger K-9 had detonated a mine while pursuing a fleeing enemy. Likely knowing by then that other mines were undoubtedly present, Patterson, along with Sergeant Patrick Hawkins, nevertheless moved to the assistance of the fallen and were in turn killed by other mines. Captain Jennifer Moreno was killed in like fashion, responding in her original capacity of a trained nurse. 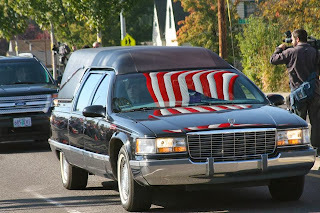 I am uncertain of the details surrounding the death of Special Agent (SGT) Joseph Peters in that same action, but I am generally aware of the circumstances of the other 26 casualties, and I cannot let stand the reported opinion that they all were mere victims – they are all heroes, bravely doing what needed to be done in taking the fight to the enemy (who rightly suffered despite our casualties) and in rendering aid to their Ranger cohort. The venue for the service was the largest in the area, an auditorium at Oregon State University. (Cody, a lifelong fan of the rival University of Oregon miles away, would appreciate the Oregon Ducks banner on the stage. Everyone present would have to agree.) 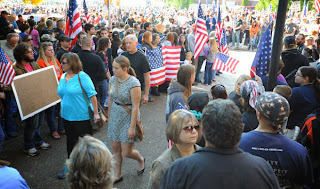 One television station in Eugene (there is no local station) reported that "hundreds" attended the service – not true. The attendees easily numbered in the thousands: the overflowing auditorium seated 1200, over 2000 stood in somber attendance outside (at least the ones I could see when I entered). One factor adding to the enormous turnout was the published threat from the noxious Westboro 'Baptist Church' to stage a demonstration at the service. (Details of that contemptuous coven of bogus Baptists can be found here.) I had already contacted two pillars of our small community to start a quiet, back-channel, quick-response group just in case the WBC threat materialized, as it has been my habit to regard seriously anyone who makes a threat. We were heartened at the huge response from this one effort, but the linchpin of creating our social media effort soon discovered other such groups nearby, so we threw in with them. It is rare to find a group such as the WBC that is so despised that it can coalesce such disparate elements as the local LGBT&c grouping with the Americans for Prosperity, but there they stood, literally right next to each other, in a solid phalanx against any incursion. Official accounts state that those despicable hypocrites were a "no-show", but more than one reliable source reported that a van drove up to the fringes of the crowd to the south, mistakenly too close, so close that the mourners were packed so tight around it that the demonstrators couldn't even exit. 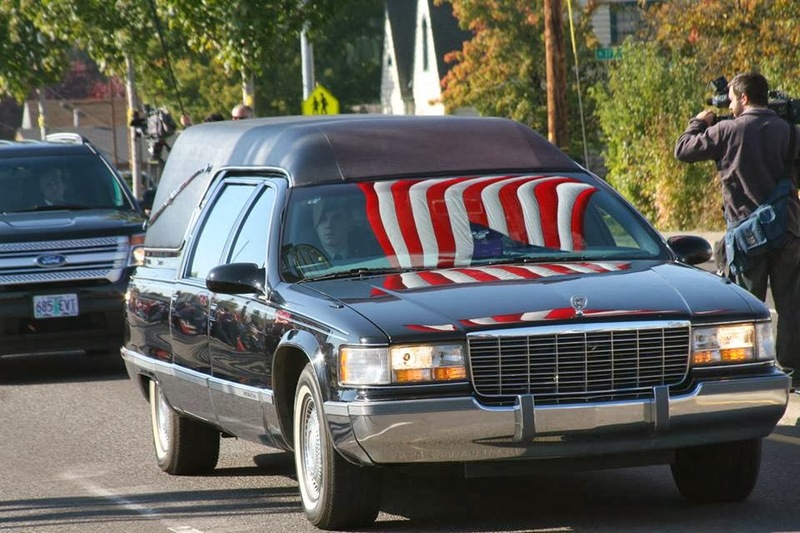 The crowd thinned out after the service to the extent that the vehicle was able to safely depart. Whether ultimately accurate or not (and who could credulously believe a denial from those clowns? 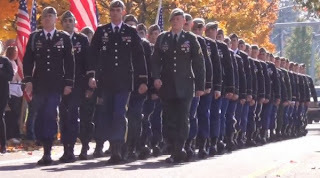 ), the fact of the matter was that the thousands grouped around the service and the family gave the protective care that a community should provide. 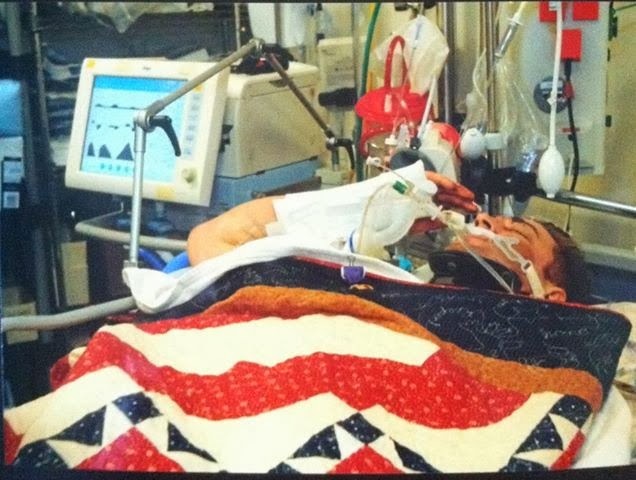 In a related story but not usually linked to the combat action with Patterson and the others above, SGT Joshua Hargis received the Purple Heart while being treated for his grievous injuries. Thought to be unconscious, as he should have been while being treated at that point, he nevertheless struggled to return the salute of the regimental commander of the 75th Rangers who had just pinned the medal to Hargis' pillow. "Grown men began to weep." SGT Hargis was the K-9 handler involved in the attack. (H/T to various sources, including Libertas and Latte. This Story was so very nice to read. I feel nothing but sorrow for the Family that lost their son. I Pray for all our soldiers to come home. My son made it back home but he could very well of been one of the casualties and I would hope that he would of gotten the support that The Patterson family received. He will be remembered in my thoughts and prayers and most of all the gratitude for his heroism. Thank you Cody Patterson and I am sorry that you had to continue your journey elsewhere just so all of us could have our freedom. I salute you.